What are some of the traditional approaches to reproducing artworks? 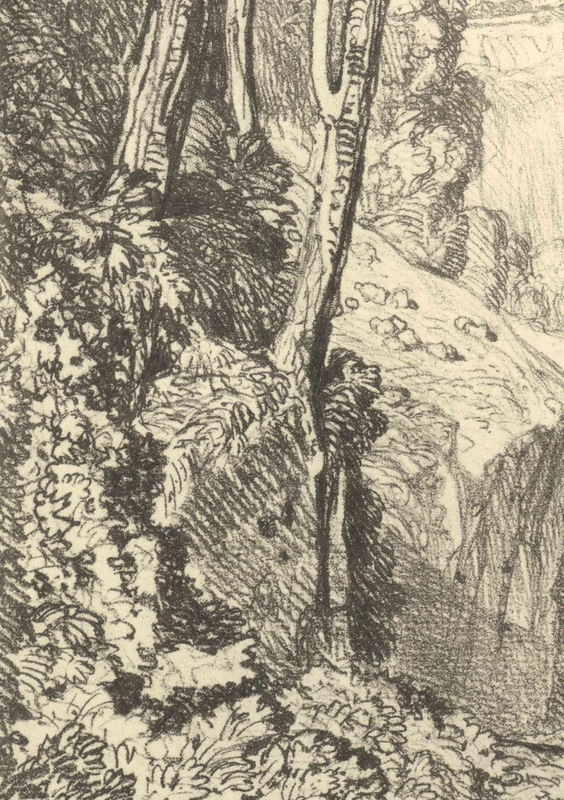 This is the final instalment in the three-part discussion addressing various reproductive approaches employed by artists starting with Claude Lorrain’s reproduction of his paintings in drawings for his Liber Veritatius [Book of Truth] and concluding with John Sell Cotman’s Liber Studiorum [Book of Studies]. In the last post I proposed some motivations driving Turner and his fellow collaborators in their choice of the printing mediums: mezzotint, aquatint, etched line and steel engraving. For this instalment, the aim is slightly different. Tuner and Cotman both produced their own versions of a Liber Studiorum but the essential purpose of each of these artists’ compendiums of prints is very different. Mindful of that there is a difference, my intention is to offer insights into their respective Liber by comparing their underpinning motivations, purposes and approaches to creating images. For Cotman, the motivation driving him to create prints was, by comparison to Turner, quite simple: Cotman wished to record his observations and to engage in the sheer joy of creative invention with the drawing and printing process. 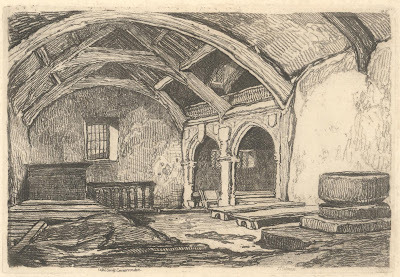 In short, his vision of creating a Liber was not so much about a predetermined goal but more the by-product outcome of on-going consistent disciplined practice, as the National Gallery of Australia’s website for Cotman’s Liber makes clear: “The etchings were all done by the artist for his own pleasure between 1805 and 1814 and were not really intended for publication” (http://artsearch.nga.gov.au/Detail.cfm?IRN=190644 [viewed 15 March 2012]). 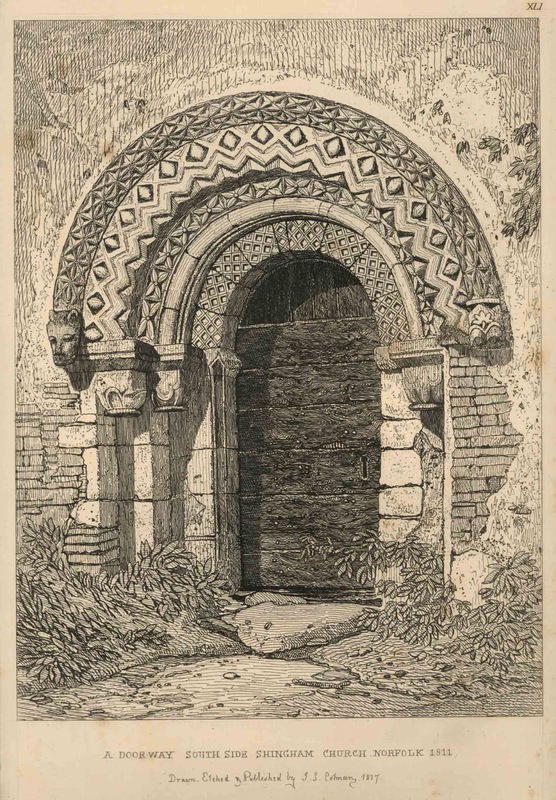 Despite Cotman’s less than grand plan for his prints, in 1838 George Bohm published forty-eight of Cotman’s plates under the title of Liber Studiorum: A Series of Sketches and Studies. 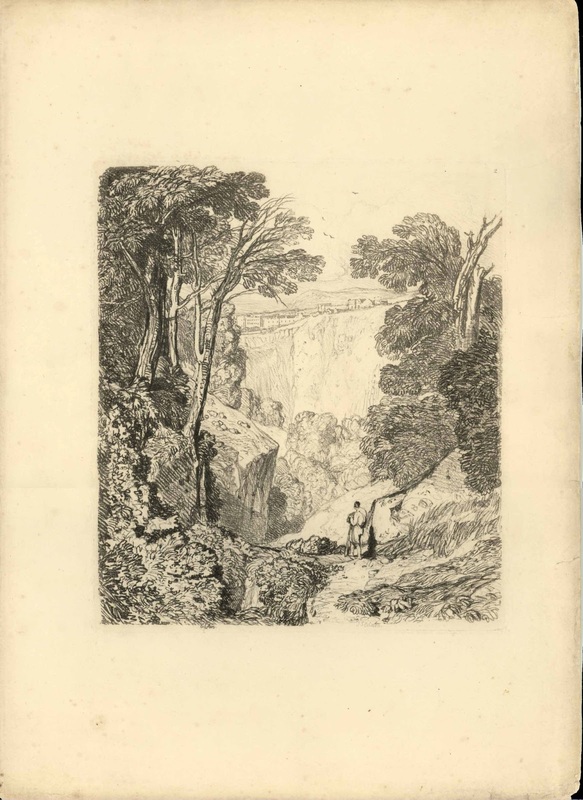 It is Bohm’s last published portfolio of Cotman’s graphic work and envisaged as an independent—“stand alone”—publication (see the full set of Cotman’s Liber Studiorum prints at the Tate Gallery’s website: http://www.tate.org.uk/art/artworks?gid=66050!&ws=acno&wv=list [viewed 15 March 2012]). Condition: a rare impression in very good condition. I am selling this etching for $120 AUD including postage and handling to anywhere in the world. This is a large print and will be shipped rolled in a tube. Please contact me using the email link at the top of the page if you are interested or click the “Buy Now” button below. 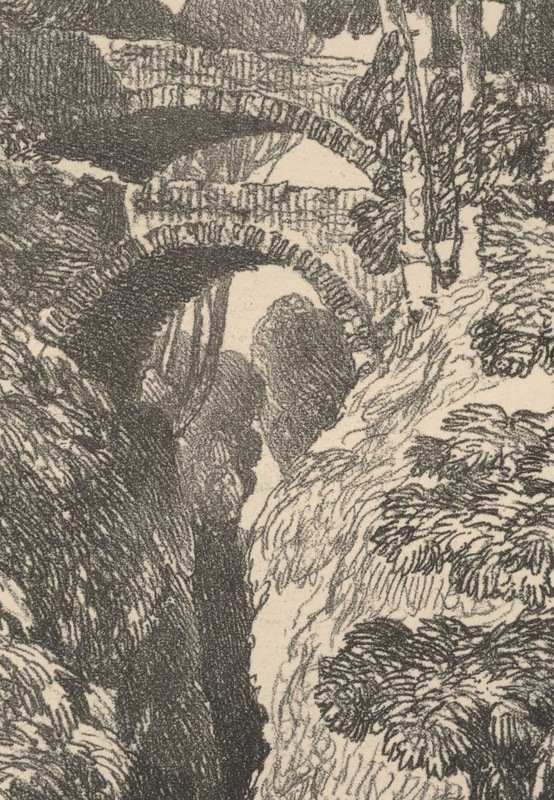 The Devil’s Bridge, Cardiganshire (shown above) is a fine example of Cotman’s fascination with recording his observations of well-known English landmarks and, importantly, his creative reconstruction of them. 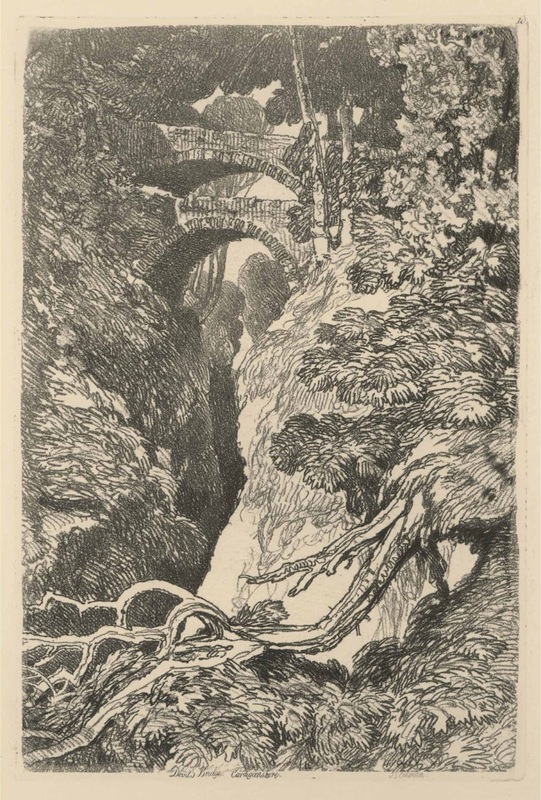 Here, Cotman’s low viewpoint in looking up to the twin bridges (before the third iron bridge was added in 1901) gave him the opportunity to apply his creative eye in making visual connections between the arches of the bridge at the top of the image and the arching forms of a fallen tree (or perhaps exposed tree-roots?) at the bottom of the image (see details below). This connection is important. The echoed motif of the bridge’s arches and the many mini-arches of the tree helps the viewer’s eye to scan the image vertically and to sense unity in the composition by the framing effect—what I term as “bookending”—created by the arch motif. Equally important, the link between the two sets of arches draws attention to the deep ravine below the bridge. 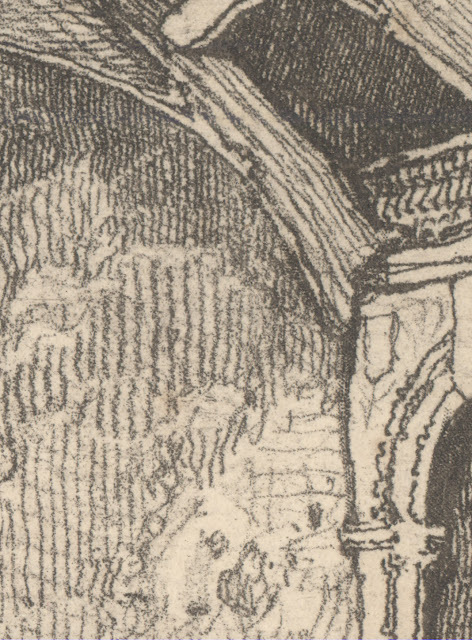 Consider, for instance, how the silhouette shape of the foreground tree-form that ends in a flurry of small arches towards the ravine edge may be interpreted subliminally as an analogue (i.e. a visual equivalent) for the sound and movement of the flowing water in the rapids far below. 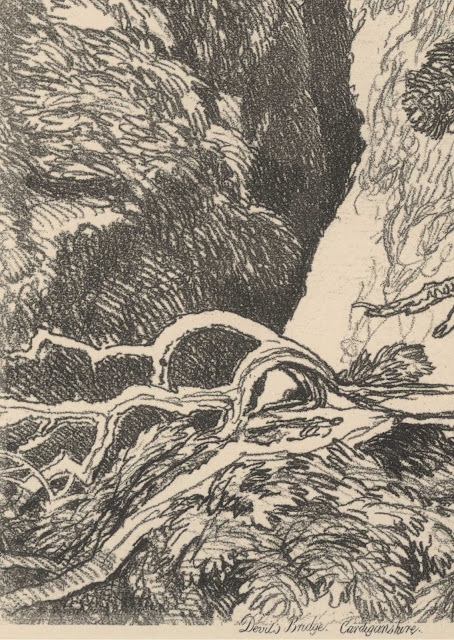 Note also how this expression sound and movement of a hidden realm in the ravine is sustained by the arrangement of lines portraying foliage and rock in that virtually all the lines are angled to the chasm’s hidden depth. Of course, not all viewers will see this orchestration of visual devices—the echoed motif of the arches and the converging lines rendering the scene—in the same way that I have described. 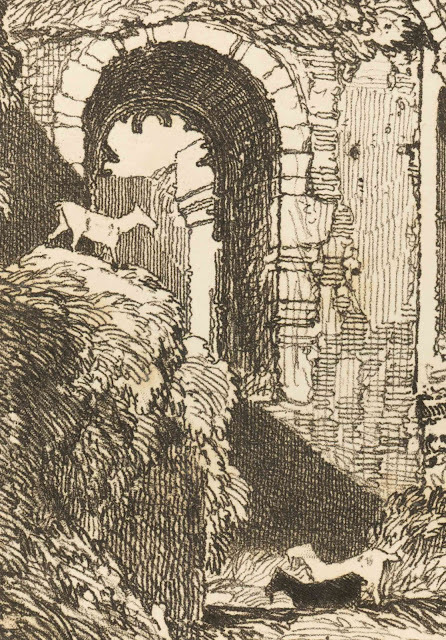 Nevertheless, my intention is not to presumptuously explain how Cotman perceived the bridge and its surroundings. Rather, my goal is to give an insight into the sort of thoughts and creative play that occur to artists when framing their ideas into an image. Moreover, I wish to explain how Cotman’s approach to making images was far more of a spirited engagement than a clinically objective topographical rendering of the same scene. 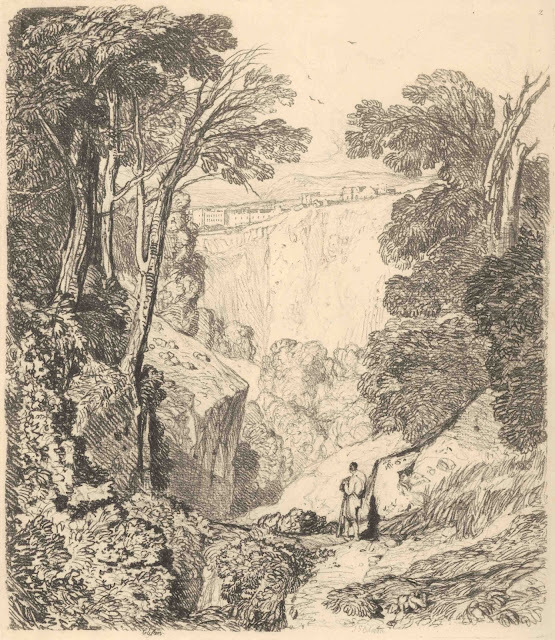 Perhaps even more revealing in terms demonstrating Cotman’s pleasure in transfiguring a scene to suit his personal proclivities is his View of Clifton (shown below). 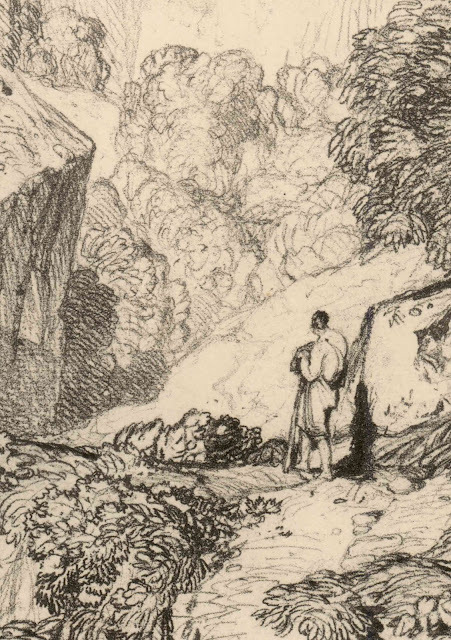 What I find curious about this print is Cotman’s choice to add a figure dressed anachronistically in classical attire—a toga? (see detail further below)—in the near foreground while in the far distance Cotman portrays a modern township with multi-storey buildings. Condition: strong impression in good condition. The paper shows minimal age toning. There is a 1 cm closed tear on the left side (2 cm from the plate mark) and minor chipping of the lower right corner. I am selling this etching for $120 AUD including postage and handling to anywhere in the world. Please contact me using the email link at the top of the page if you are interested or click the “Buy Now” button below. Also showcased in this print is Cotman’s propensity to look at a scene through a man’s eye. By this curious comment I am referring to the outlook of the generic man—the primordial hunter—whose field of vision is clear and fully focused at the centre while vision around the peripheral rim is focally blurred. From the author’s personal experience, as a man suffering from a primordial hunter’s vision, I can speak with great authority that a tasty morsel of chocolate is easy to find in a cluttered refrigerator when it is in the centre of the fridge; the same chocolate is difficult to fine if it is placed in the trays above, below or to the sides. In Cotman’s presentation of this propensity, the centre of the image is portrayed using fine wiry lines connoting focal clarity matching where Cotman’s eye was focused while the peripheral rim of the image is portrayed using thicker lines connoting blurred vision where his attention was not drawn (see details below). 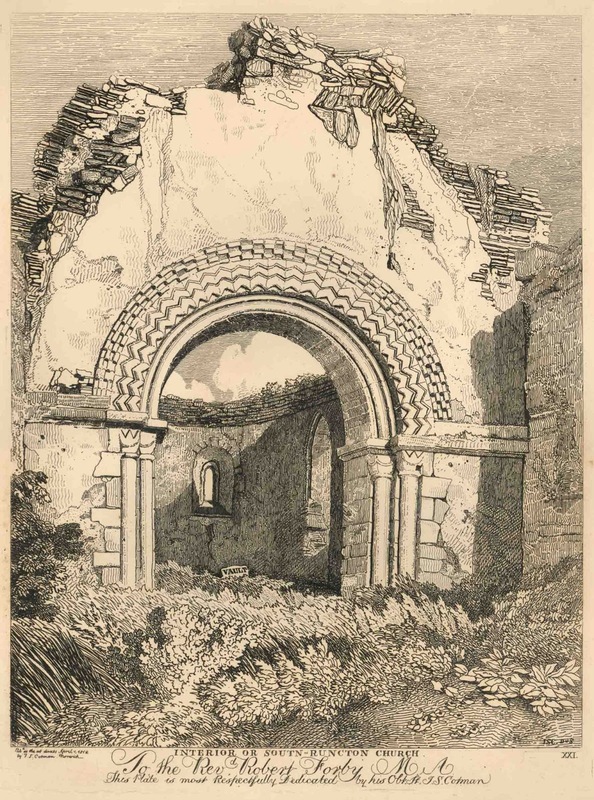 Cotman’s leaning to personal satisfaction—key components of his motivation and purpose—when creating his prints is far removed from Turner’s ambition summed up by Renee Free (1993): “… to show his contemporaries and posterity his concept of landscape composition” (Liber studiorum: etchings and mezzotints of types of landscape: J. M. W. Turner: from the collection of the Art Gallery of New South Wales, p. 1). To achieve this goal, Turner structured his Liber with six categories of landscape—Historical landscape (8 plates); Marine landscape (11 plates); Mountainous landscape (12 plates); Architectural landscape (11 plates); Elevated Pastoral landscape (14 plates); Pastoral landscape (14 plates)—with the prints in each of these categories designed as exemplars of compositions demonstrating what Free (1993) describes as “the possibilities” (ibid.) within each the category. By contrast with the categorisation of landscape addressed by Turner, Cotman’s interests did not extend to pedagogical pursuits. Nevertheless, Cotman did engage with a personal pursuit of finding congruence between his approach to watercolour and his approach to printmaking. 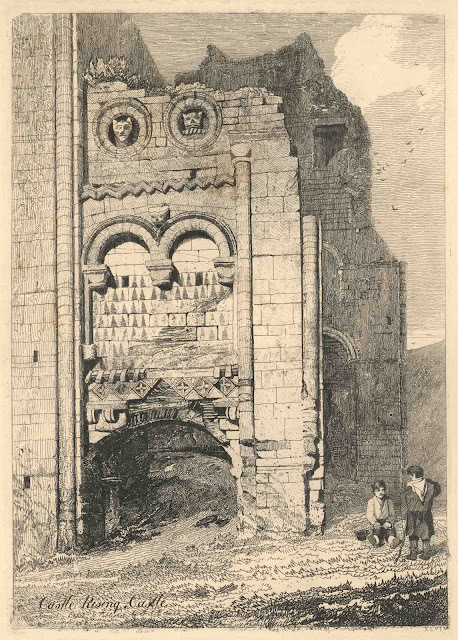 For instance, Cotman’s approach to watercolour is summarised well by Richard T Godfrey (1978) in Printmaking in Britain, in that Cotman’s watercolours are “constructed by the harmonious disposition of blocks of cool tone, washed on smoothly in flat areas to create beautiful patterns of interlocking shapes” (p. 94). 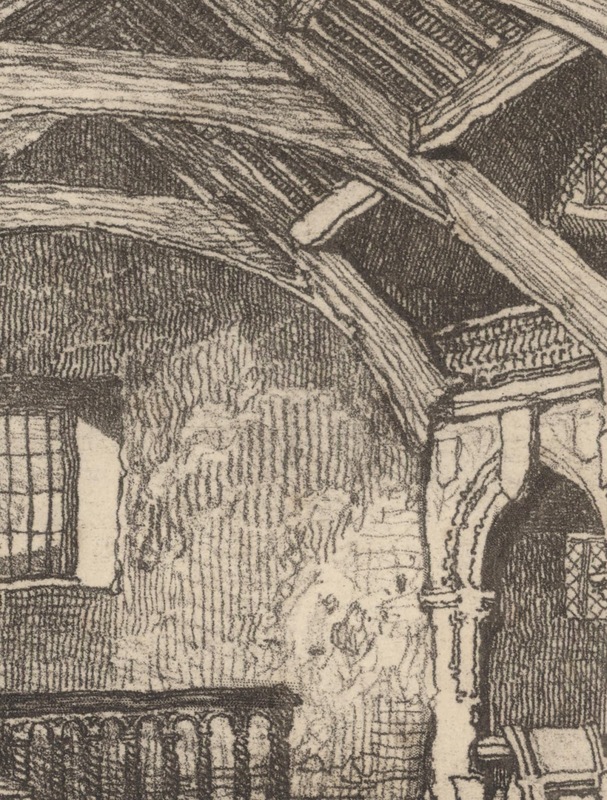 In finding congruence with printmaking, Godfrey then proposes that Cotman’s “tones of wash drawing were translated into a restless surface of wiry, scratched line, delighting in varied details of textures” (ibid.). 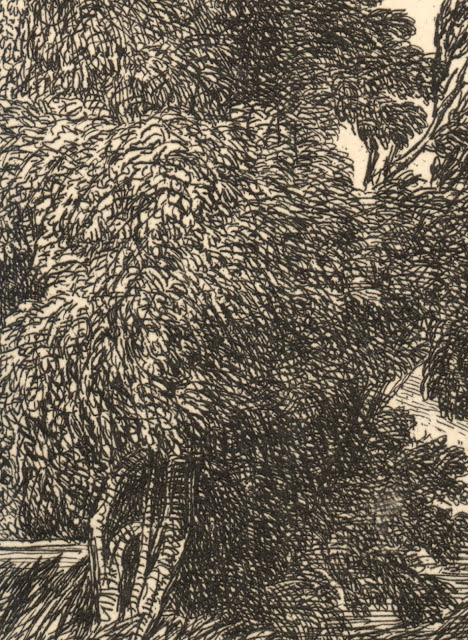 Regarding Cotman’s approach by using such “wiry” etched lines, a superb example of this attribute is A Study (shown below). Although diminutive in size, this print projects a grand scale through its bold—almost posterised—tonal treatment and latent energy expressed by Cotman’s “restless surface” treatment of observed textures. Condition: a rare impression in good condition. 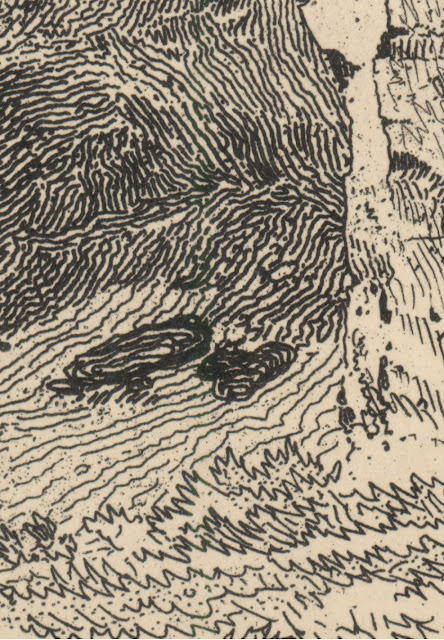 There is a 1.2 cm closed tear at the top of the sheet (17 cm from plate mark) and very pale scattered foxing towards the edges of the sheet. I am selling this etching for $130 AUD including postage and handling to anywhere in the world. This is a large print and will be shipped rolled in a tube. Please contact me using the email link at the top of the page if you are interested or click the “Buy Now” button below. 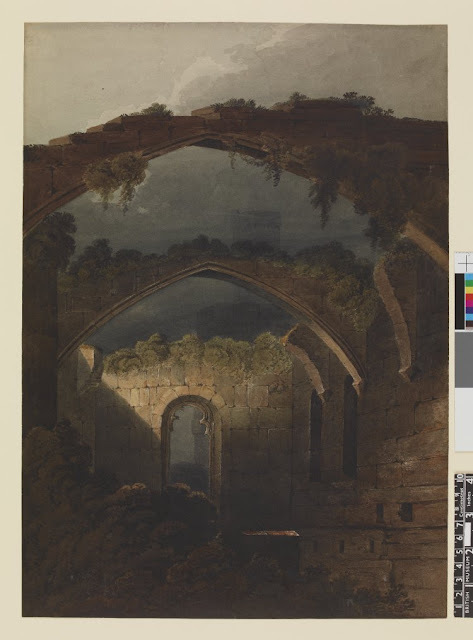 Indeed, even a brief overview of Cotman’s oeuvre shows his disposition for framing compositions with what Adele Holcomb describes as his “poetry of entrances” (ibid.). 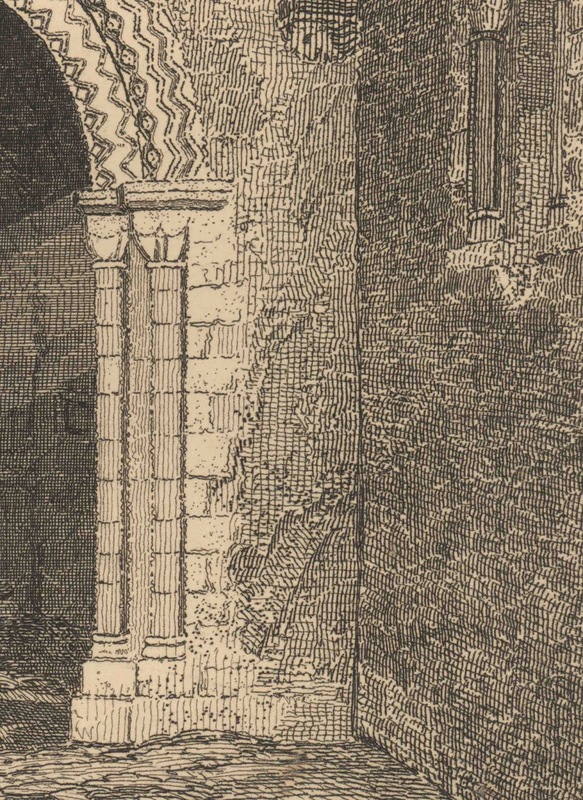 For example, in Conway Castle (shown below) the viewer is invited to look through an entrance of stone arches spanning the castle’s derelict great hall. For me, the “poetry” of this entrance is partly to do with the suggestion of hidden mystery beyond the hall’s trefoil window at the farthest end of the hall. 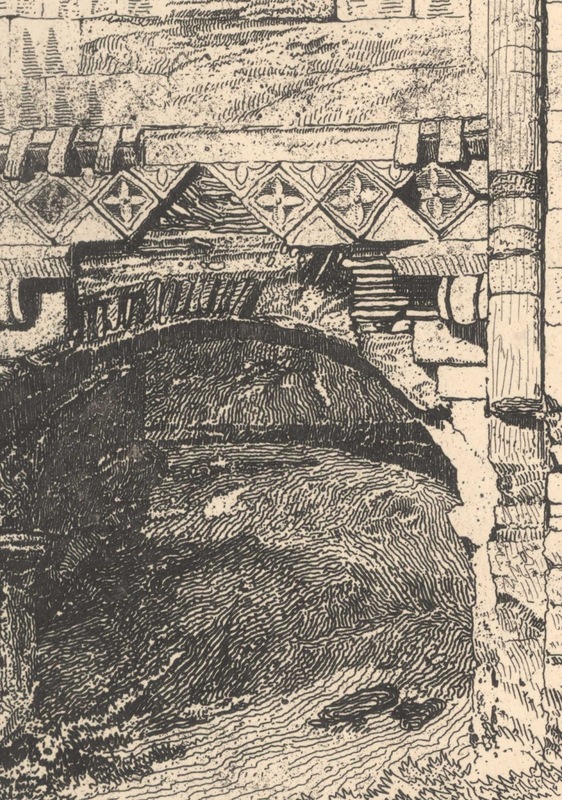 Also adding a note of poetic symbolism to the arched entrance is the notion of vanitas (i.e. the symbolism that all things will pass/change) posed by the skeleton-like arches and the black and white goats standing confidently as if the ruin were their home. This everyday glimpse into the castle laced with a light hint of implied meanings is in stark contrast with Turner’s forbidding images of the same castle; for example Turner’s Conway Castle, c. 1789 see (http://www.tate.org.uk/art/artworks/turner-conway-castle-tw0308 [viewed 25 March 2013]) and similar romantic images such as Samuel Prouts’ moody watercolour (see further below) composed from a similar angle of view as Cotman’s viewpoint. Condition: strong impression in very good condition. The paper shows minimal age toning. There is a small (6 mm) closed tear on the bottom right side (7.7 cm from the plate mark). Cotman’s approach of framing many of his images with the “poetry of entrances” sometimes goes further than a nominal suggestion of an entrance. For example, in the earlier prints before those of the Liber, Interior View of St Mary's Chapel at Stourbridge near Cambridge, A Doorway South Side Shingham Church Norfolk, Interior of South-Runcton Church and Norman Castle, Rising Castle (all shown below), the visual device of portraying a doorway entrance is the pivotal feature of these images. 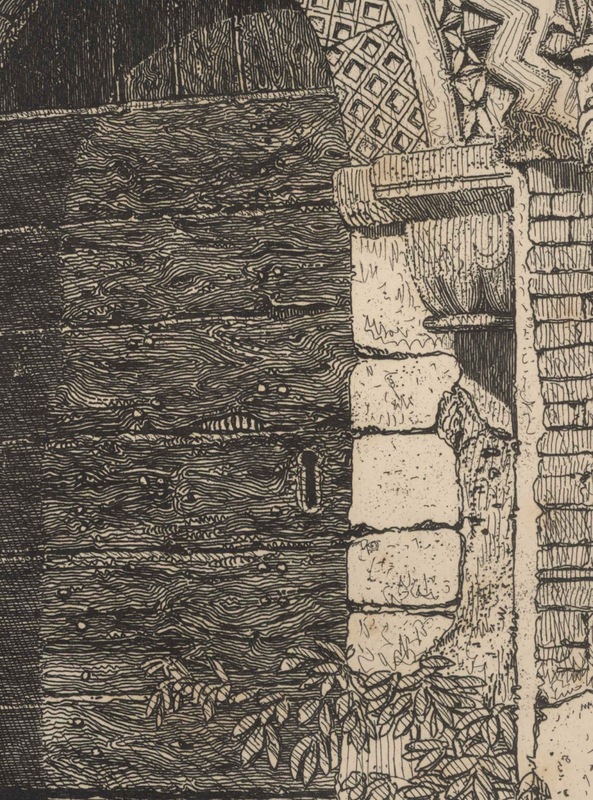 Beyond this visual device is another hallmark of Cotman’s approach to illustrative reproduction: mimetic rendering of textured surfaces as can be seen in the details of the prints shown below. Condition: very strong impression in virtually pristine condition. The paper shows minimal age toning. Condition: very strong impression in very good condition. The sheet shows a bump to the upper left corner (well away from the plate marks). There is slight age toning at the right edge and two faint foxing marks. I am selling this etching with the print shown above—Interior View of St Mary's Chapel at Stourbridge near Cambridge—and the two prints shown below—Interior of South-Runcton Church and Norman Castle, Rising Castle—(i.e. four prints) for $300 AUD including postage and handling to anywhere in the world. The four prints will be shipped rolled in a tube. 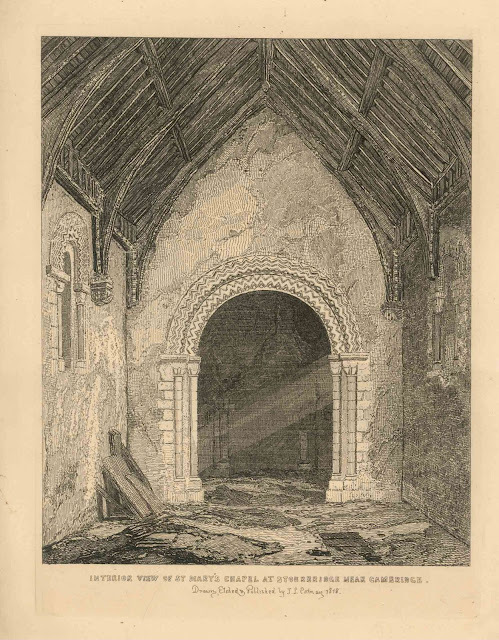 Please contact me using the email link at the top of the page if you are interested or click the “Buy Now” button below the print, Interior View of St Mary's Chapel at Stourbridge near Cambridge. Condition: very strong impression in excellent condition within the plate area and 2 cm on all sides surrounding the plate area. 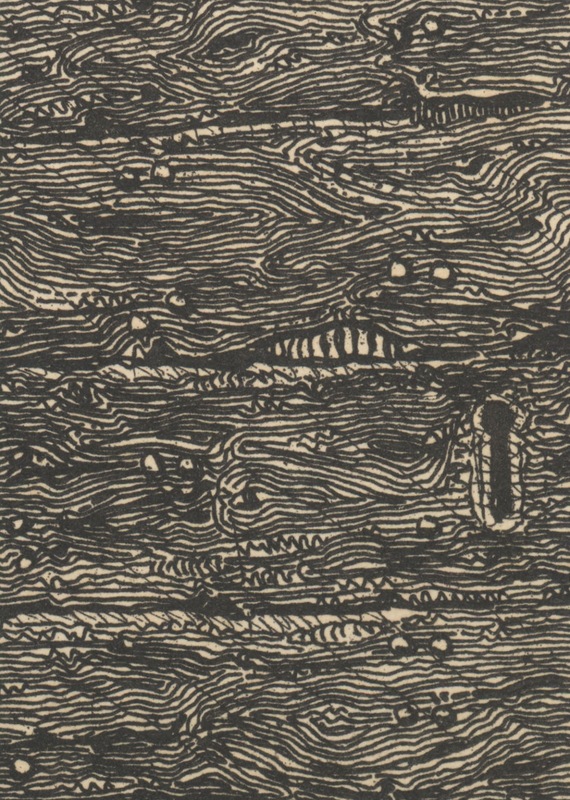 In the margins there are closed tears (none extending closer than 2.2 cm from the plate mark), bumps and light staining extending 2 cm from the top edge of the sheet. The sheet shows a bump to the upper left corner (well away from the plate marks). I am selling this etching with the two prints shown above—Interior View of St Mary's Chapel at Stourbridge near Cambridge and A Doorway South Side Shingham Church Norfolk—and print shown below—Norman Castle, Rising Castle —(i.e. four prints) for $300 AUD including postage and handling to anywhere in the world. The four prints will be shipped rolled in a tube. Please contact me using the email link at the top of the page if you are interested or click the “Buy Now” button below the print, Interior View of St Mary's Chapel at Stourbridge near Cambridge. Condition: very strong impression in very good condition. In the margins there are closed tears (none extending closer than 4 cm from the plate mark), a chipped corner (upper left) and age toning to the far extremities of the sheet. 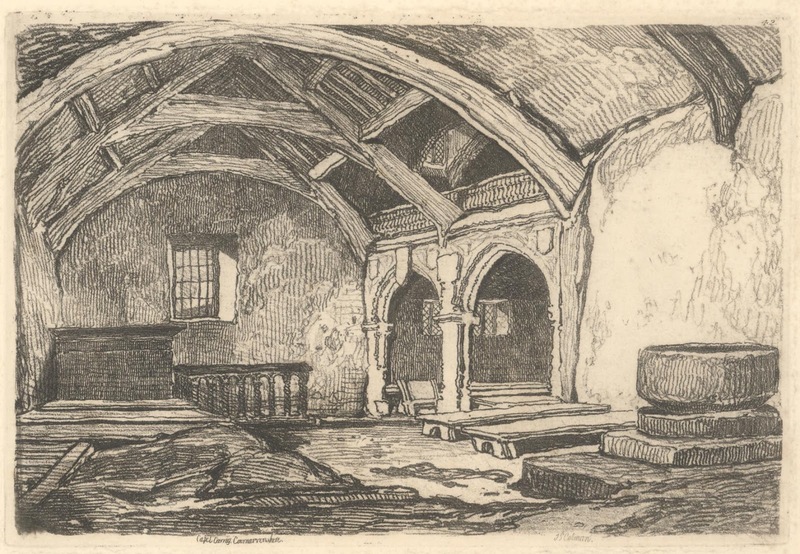 I am selling this etching with the three prints shown above—Interior View of St Mary's Chapel at Stourbridge near Cambridge, A Doorway South Side Shingham Church Norfolk and Interior of South-Runcton Church (i.e. four prints) for $300 AUD including postage and handling to anywhere in the world. The four prints will be shipped rolled in a tube. Please contact me using the email link at the top of the page if you are interested or click the “Buy Now” button below the print, Interior View of St Mary's Chapel at Stourbridge near Cambridge. 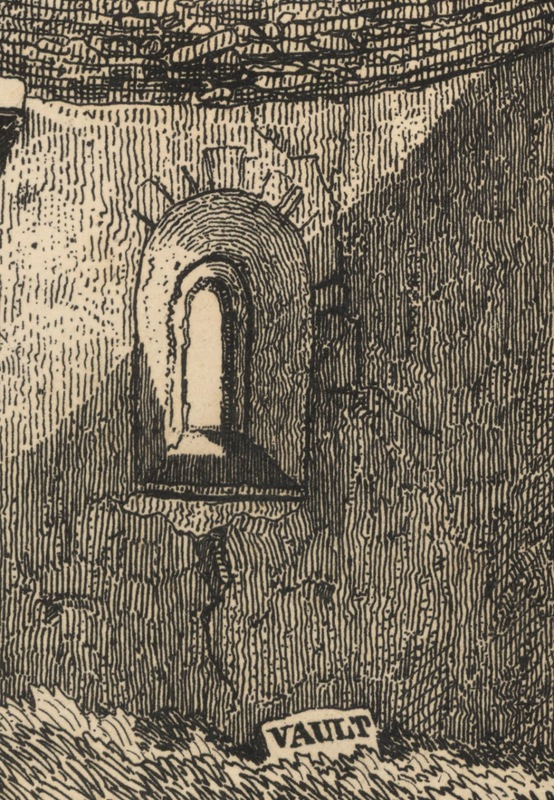 As a final point of separation in the approaches of both Cotman and Turner in executing their Liber prints, I wish to draw attention to how both artists portray textures. 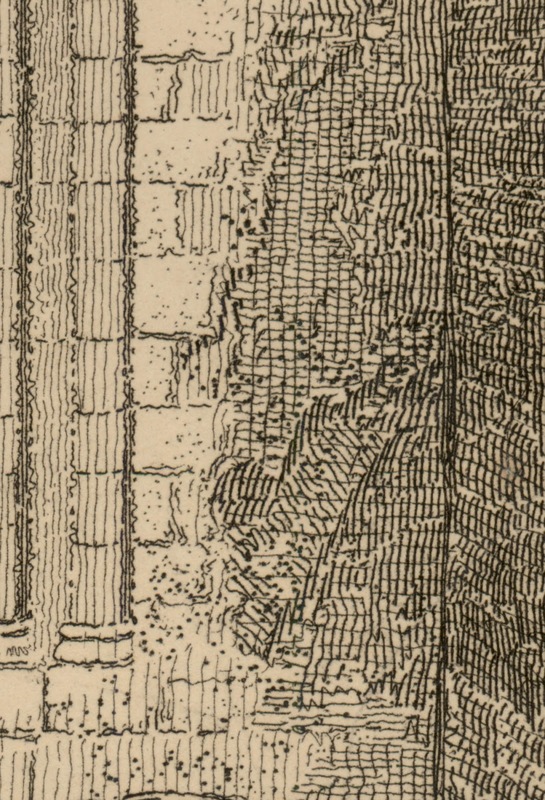 In Cotman’s Liber prints the use of soft-ground etching replicates in a direct way the crumbly aspect of his pencil rendered textures (see detail below) as this is an intrinsic attribute of the soft-ground process of etching. 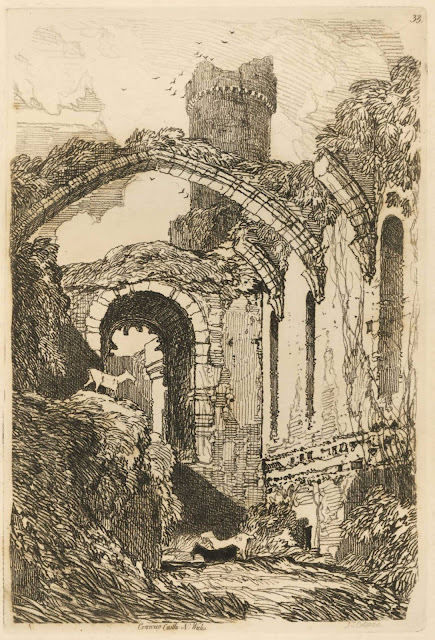 By contrast, Turner’s approach to representing textures relies on delicately manipulation of the mezzotint prepared plate so that by scraping and burnishing he can emulate subtle changes of texture in his chosen subject. 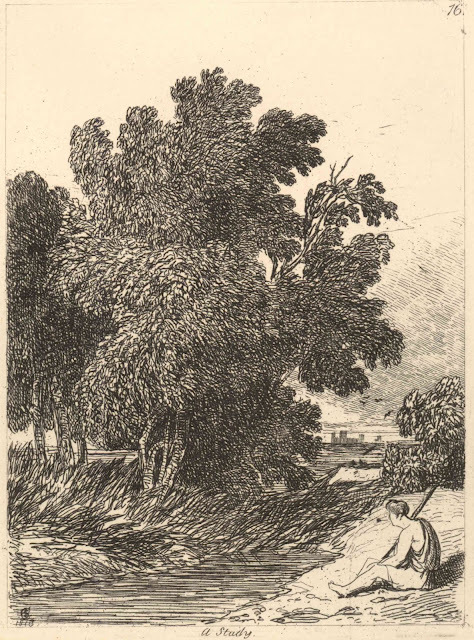 In Cotman’s soft-ground etching from his Liber prints, Capel-Carrig, Caernarvonshire (shown below), this unique quality of the soft-ground process is revealed very clearly and to my eyes the type of marks that the process creates makes his images tactilely appealing. Condition: a rich impression in good condition. There is scattered grey spotting in the margins (these may be the result of conservation eradicating foxing but the print does not appear to be bleached as the sheet has light age toning). 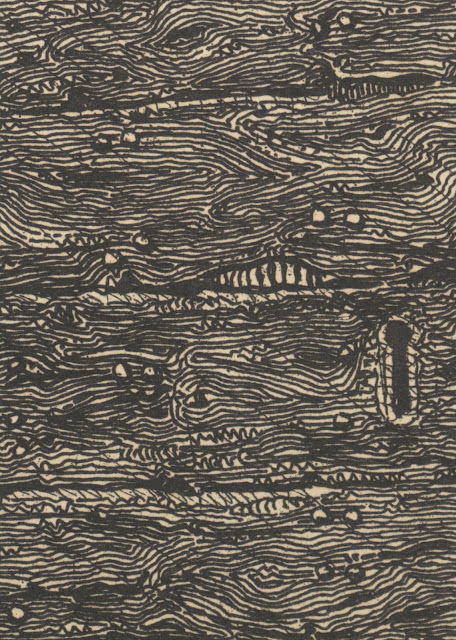 There is a closed tear (1 cm) lower left edge (6.5 cm from the plate mark).